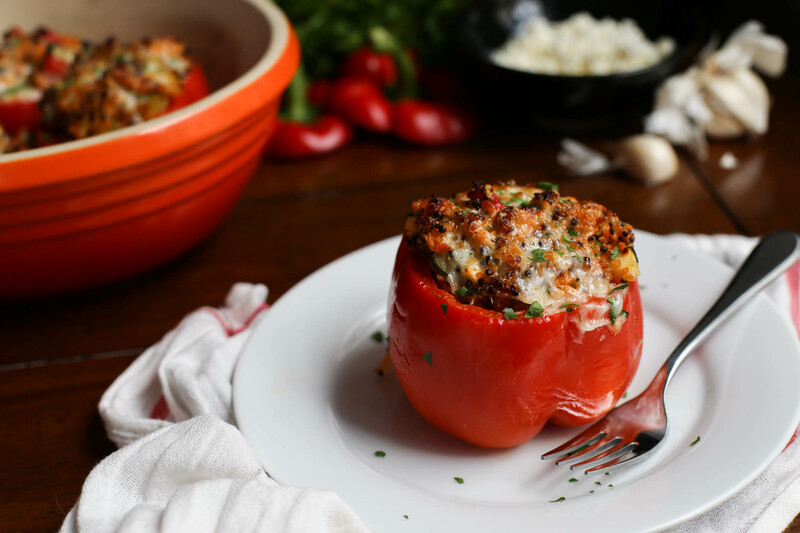 This recipe features a whole lotta deliciousness stuffed into one bite. 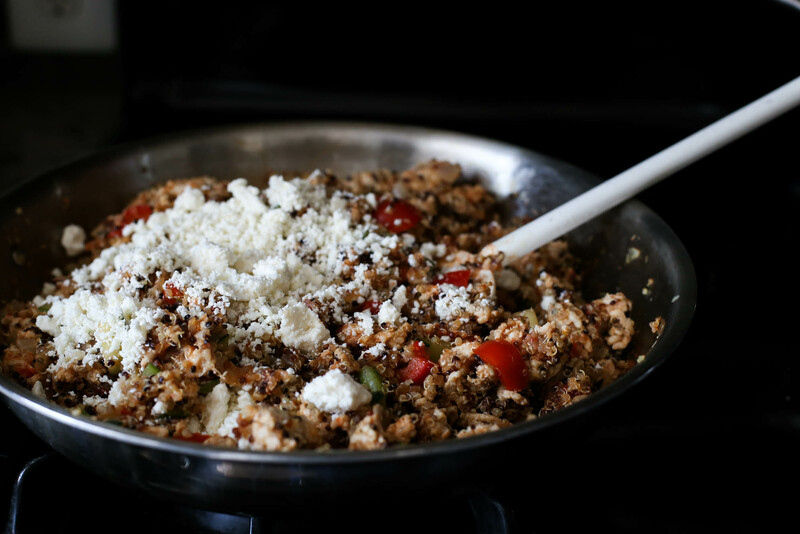 You’ve got quinoa, zucchini, onions, garlic, feta, and ground turkey, booyah. 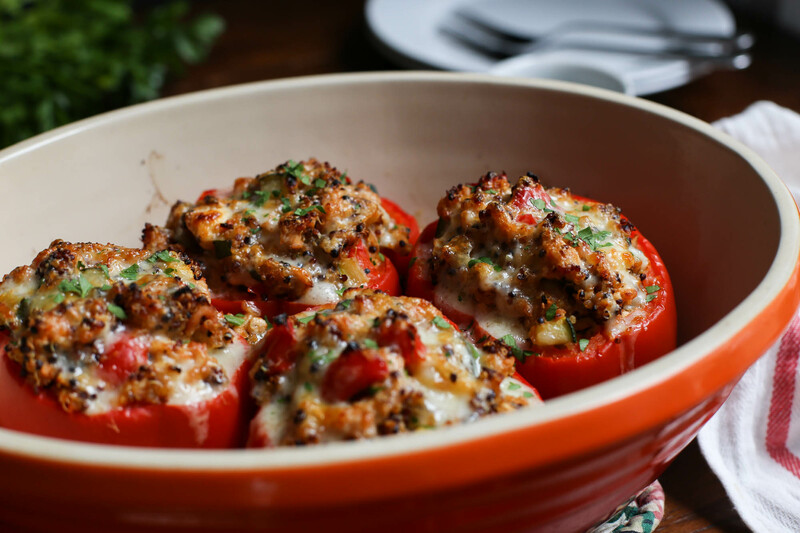 Stuffed peppers is a recipe that I pull out of my pocket when I have some guests to impress. 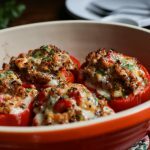 The recipe has a few too many steps to make it a convenient weeknight meal, so I consider it a special occasion or weekend dish. I’ve made it for my parents and even my in-laws, so that should say something about my trust in this recipe. Quinoa: use rice instead for a more budget-friendly option. Still not into ground turkey: use any kind of ground meat your heart desires. 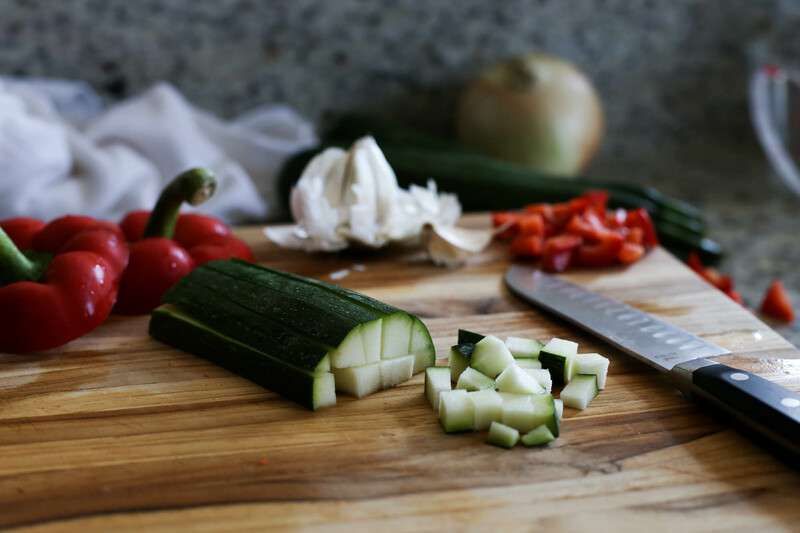 Veggies: I like to use finely chopped zucchini, but you can add spinach, mushrooms, etc. It’s really chef’s choice. Vegetarian: use chickpeas or beans instead of ground meat. This is definitely a multi-tasking recipe, where all of the separate parts come together to finish baking in the oven at the end. I start the recipe by making quinoa. If you’ve had quinoa before and thought it tasted kinda funny, make sure to always rinse it first before cooking. I prefer quinoa vs. rice because it cooks more quickly and it has bonus health benefits (more fiber! protein! iron! magnesium! woo!). The next step is to boil some water for the peppers. Slice the top and stem off the peppers and take out all the seeds. If you’re thrifty you can dice up the pepper around the stem as well and add that into the filling mixture later. I quickly boil the peppers so that they start to soften before baking, otherwise they take too long and your filling will dry out. While both of those things are going on, I also start cooking the onions, meat, and zucchini in another pan. That’s about three stovetop burners going at the same time, yikes! But it all works out, trust me. When making the meat mixture, use the largest pan you own. Once you get to the step of mixing in the quinoa and feta, you will thank me. All that filling goes into the boiled peppers and then bakes in the oven for about 15 minutes. I usually have a little bonus filling left over as well, which gets gobbled up while I wait for the stuffed peppers to finish baking. Then, because why not, I sprinkle a little more cheese on top and broil everything so that it gets nice and gooey. 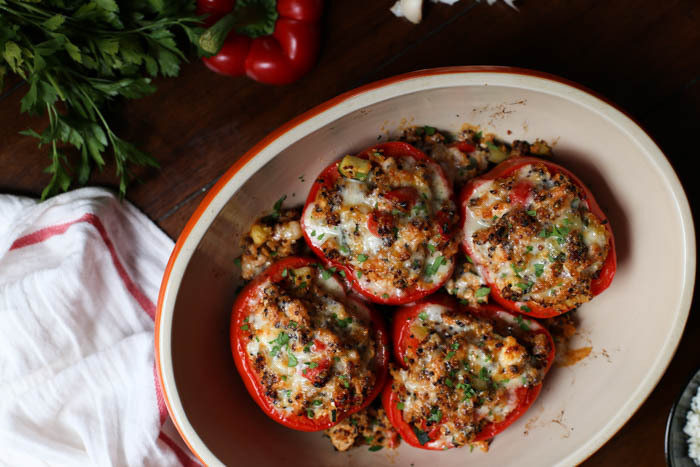 A sprinkle of fresh parsley on top makes the whole dish look like a million bucks. (Fixer Upper reference, anyone?) I like to serve the peppers with a side salad or roasted broccoli. Gooey, hearty, tasty goodness. Mission accomplished. Coat a small baking dish with cooking spray and set aside. Bring the chicken stock and quinoa to a boil in a small pot. Once boiling, reduce the heat and simmer, covered, for 15-20 minutes until the quinoa is soft. Preheat the oven to 350 degrees F. Bring another large pot of water to a boil. Cut the stems and very top of the peppers off, removing the seeds. (If desired, dice the part around the stem and add it later with the zucchini.) Place the peppers in boiling water for 4-5 minutes, which you may have to do a few at a time. Remove from the water with tongs and drain face-down on a paper towel. Meanwhile, heat the olive oil in a large pan over medium heat. Add the onion and garlic and sauté for 5-6 minutes until the onion begins to soften. Stir in the ground turkey, oregano, salt, and pepper and cook until the turkey is browned. Add the zucchini (and any extra diced bell pepper) to the skillet as the turkey finishes cooking. Cook 3-4 minutes more until the zucchini starts to soften. Stir in the tomato sauce. Remove the pan from heat and stir in the quinoa and feta. 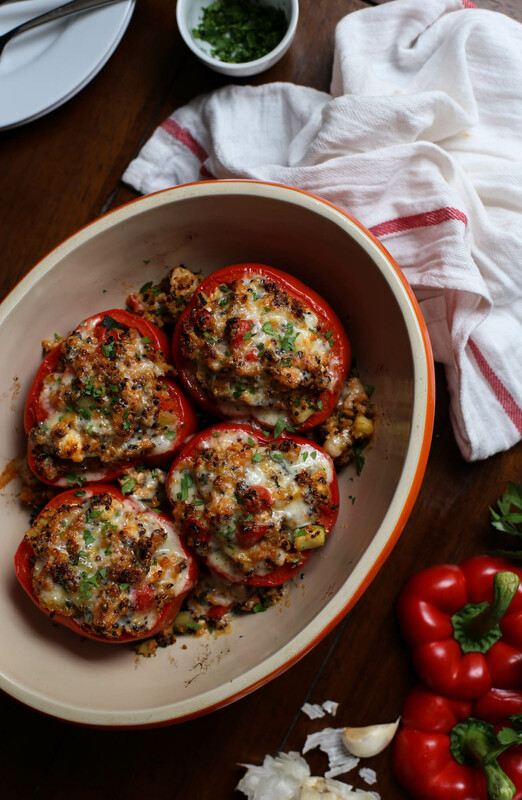 Place the boiled peppers upright in the baking dish and spoon the filling into the center of each. Bake for 15 minutes. If desired, top with shredded cheese and broil for 5 minutes more. Serve warm, sprinkled with parsley.